I have debated sharing this inspiration board that I made....only because I kind of want everything to be a surprise for the guests, but I decided that I'm just too excited not to share it! Ultimately, everything will still be fun for them to see, no matter what....and let's face it. Everyone is coming to see Audrey, not my cute decorations and food! So...here it is! Unfortunately, I don't have all of the original sources for the photos, but I do know that the invitations in the top right corner are Jones Design Company, and the glitter pumpkins are mine. (If you know the sources, or if the photos are yours, please let me know so I can give credit!). 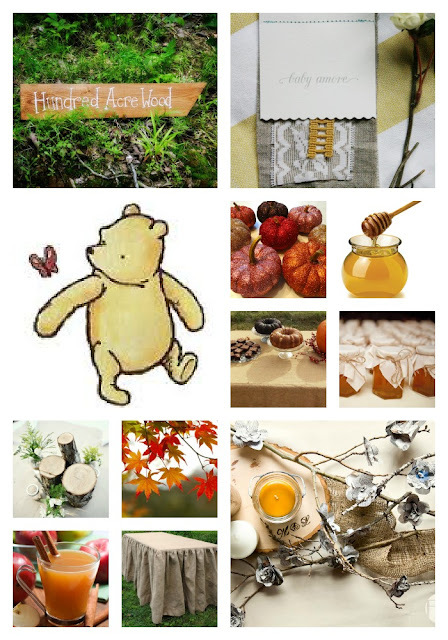 So, the theme is Classic Pooh and fall. Audrey loves Pooh and I thought it would be cute and appropriate to include some fall elements as well, since her party will be at the end of October. We'll be celebrating a couple days after her actual birthday, which is on the 25th. I cannot believe my baby is turning one next month! Everyone says how quickly they grow, but I don't think it's something you can imagine, until you experience it. I feel like this has been the fastest year of my life! We are just so blessed and so excited to be celebrating our little Audrey Pearl as she turns one! First off, i can't believe your baby is one!!! And secondly, i love that you are using classic pooh and fall decorations. It looks perfect! I was excited to see this post and can't wait to see more details on your Birthday planning for Audrey. I have been following your blog for awhile and just so happened to have my twins 10-26 my Daughter's name is Aubrey. So I felt like we had so much in common. I love to party plan, but just don't have the time like I used to. We are doing a fall pumpkin theme for our boy/girl 1st B-day. Your daughter is just so cute!!! That's too funny about our daughters names and birth dates! I totally hear you on not having enough time! I'm sure it's even more challenging with twins! :) Your theme sounds great!!! Enjoy the planning & celebrating! Thanks you too. Right now I'm obsessed with Pinterest ideas, I just need time to do them all. I think I discovered your blog when you were still pregnant. I agree it has been the fastest year of my life too! I will stay posted for any new fall/pumpkin crafty ideas you have. Your fall decor looks great! What's been happening around here! It's fall at our house!